Indirasite: Utilizing the craziest moment with a beautiful book " Gurkha"
Utilizing the craziest moment with a beautiful book " Gurkha"
ready to move on. Due to the bad weather today, the public transportation was very thin. When I reached to the train station, many people were returning back from that station informing to people about the situation, but still many were sunk among the crowd shrinking to get in tightly. I was also the one became confused whether to return back and find out the shuttle bus or try to see the situation for awhile. I chose the second option and went into the station with a lot of effort and kept on waiting in the crowd. One of my colleagues informed me she was waiting for the train for a long time and I mentioned mine was also the same by replying her message. I informed to the office I was getting late. I didn't know what exactly went on but as many others were in the same boat I was hopeful something would happen to carry us. After almost 30 minutes of waiting, I heard the movement of trains, but due to a large number of people in the station I didn't get a chance to enter into the train. I eventually got into after the five trains left me behind. The train crew announced the F train would run to the E line, that's the way I rode into that one. Unfortunately, it kept on moving irregularly due to the water on the track and stopped frequently every single station. I took my mobile out of my pocket. 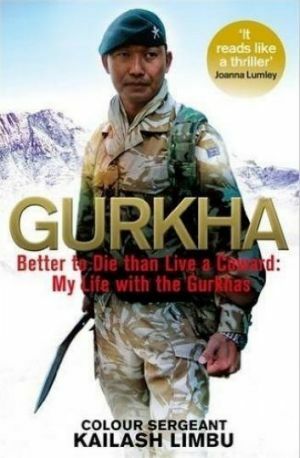 I had purchased the ebook name 'Gurkha' by Kailash Limbu. I had been thinking to read that book for a long time but I was with an another one which was one of my favorite writers. Reading through the second chapter I found myself in the village of my own. His explanation of his birthplace and the surroundings were very similar and those presentations reflect my own childhood. My feet were tired and I was feeling like sick due to standing for a long time as no seats were available for me. I kept on standing by holding the train with one hand and using one hand to hold my mobile. I forgot my pain rather I enjoyed the moments sailing into each content I utilized the time as the train was consuming more time than as usual. Though it was quite irritating as it was stopping frequently throwing the passengers away, but I had reached the village of Kailas Limbu and the Limbu people who drink the local alcohol at home which was very similar to my village and the livelihood of my own birthplace. I am looking forward to finishing his ebook 'Gurkha' all the way until the end of the chapters. I am so thrilled to go ahead and finish all of the contents. I can't wait for tomorrow to open the page again. Every chapter of the life is filled with different components and commuting to work on the train is a quite fun while enjoying with the invisible friends and in the fantasy of castle. Thanks, Mr. Limbu for writing such an interesting book. Reading the book like yours has a different fun than the those of a foreign writer. I am proud to be Limbu by myself and my curiosity is still beyond the horizon to learn much more about my caste, my ancestors and much more. I hope this book will provide me the various knowledge and widen my understanding which will be always exhilarating.